It has been so long since my last post for Tips section. 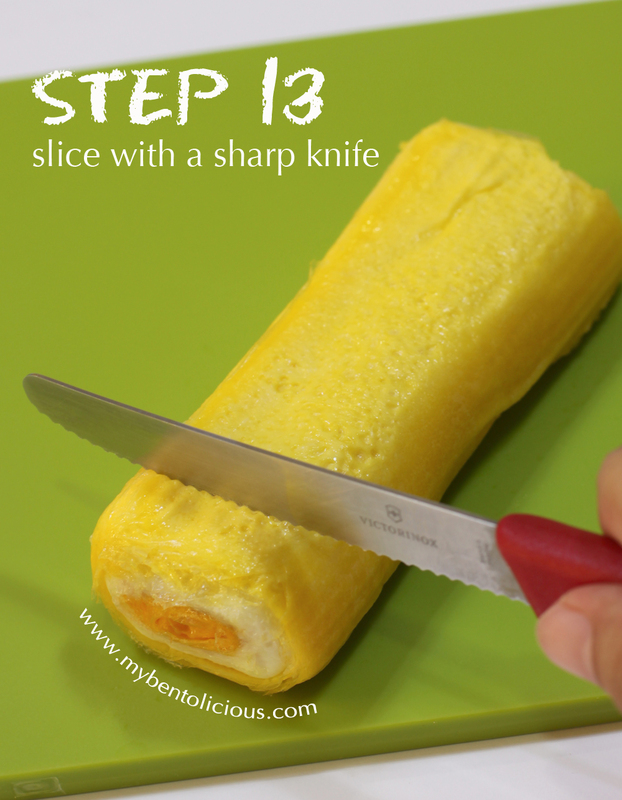 And since so many bento friends have been asking me on how I made my tamagoyaki, I decided to take some step-by-step pictures on how I did it. Hope this pictorial can help, although my way is not a perfect one but I have a lot of fun make it this way. Usually I follow Maki's recipe from Just Hungry to make my basic tamagoyaki but you can improvise with different ingredients later. You don't need to do this if you just wanna make a regular tamagoyaki. 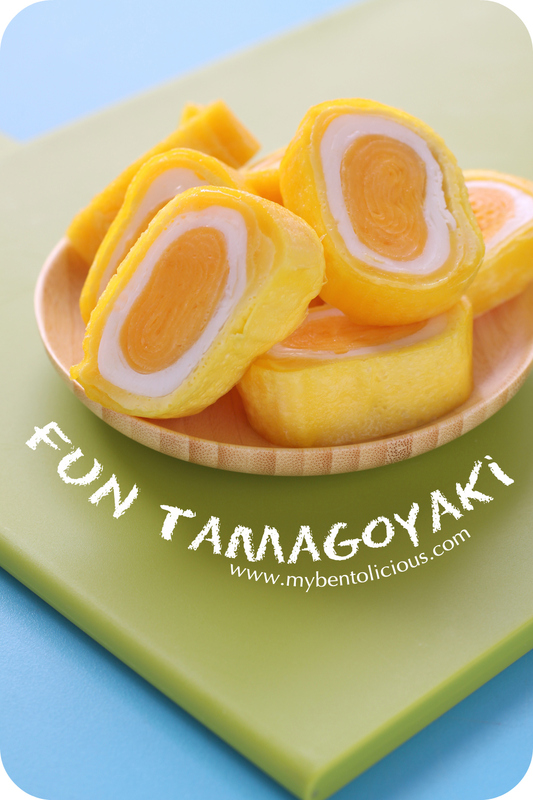 I separated the egg yolk and the egg white because I want to show you how to make 2 tones tamagoyaki. After you put all the ingredients inside the bowl then beat the mixture until even. You don't need to beat the egg white. And if you get a lot of bubbles in your egg mixture like mine, no worries ... as long as you use low heat then tamagoyaki will turn out fine. If you don't have tamagoyaki pan then you can use your non-stick pan. 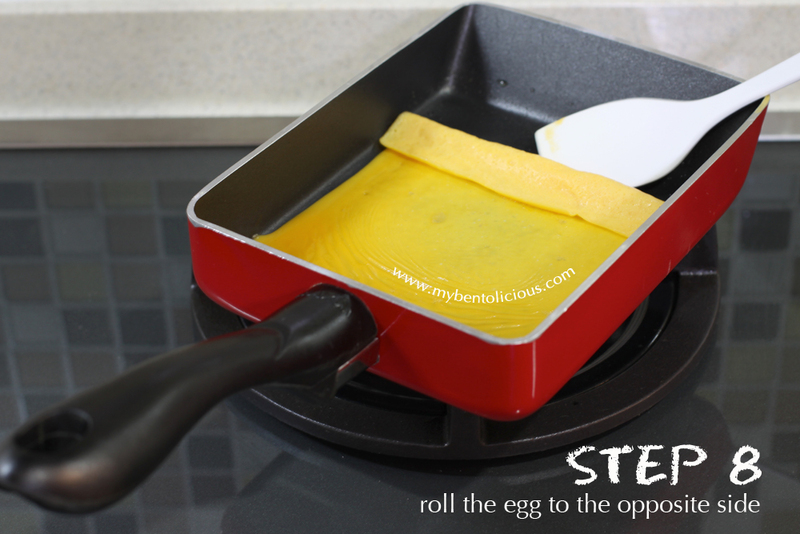 I use small spatula/turner to roll the egg later, but you can also use chopsticks if you feel comfortable with it. 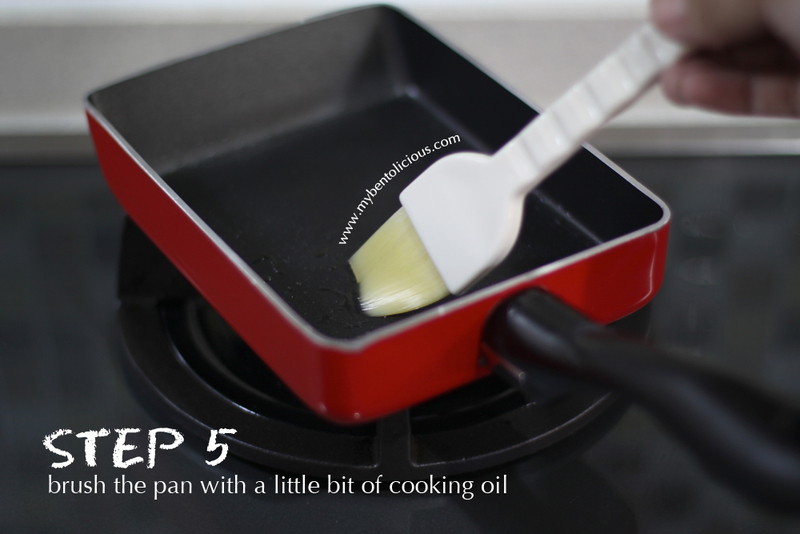 Brush the pan with a little bit of cooking oil before using it and in-between each layer making. If we use high heat then the tamagoyaki will burn or you will get a very dry tamagoyaki. So keep in mind, low heat is a must. If you are an expert then you can use medium heat. 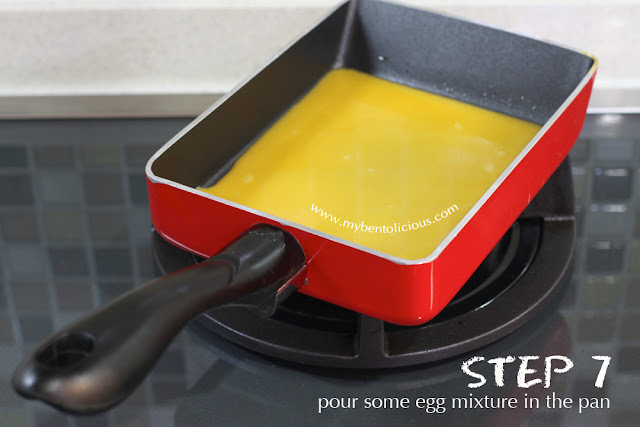 You can start pouring some egg mixture into the pan after you heat up the pan. Don't pour too much because it will be hard to roll later. When you see the top layer like wavy water then you can start roll the egg to the opposite site as shown at the picture below. Don't wait until it is too dry because the first layer is very crucial so you can have a nice and neat center. 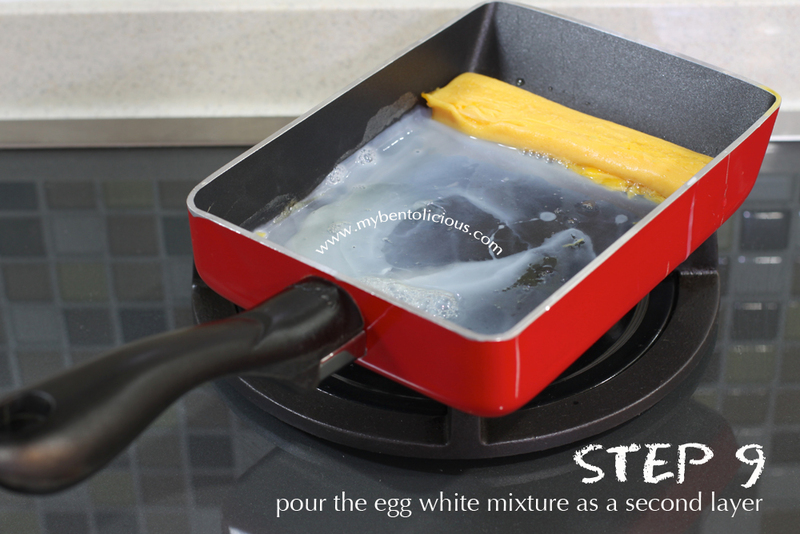 Push the egg gently to the first place and start pouring the egg white mixture. 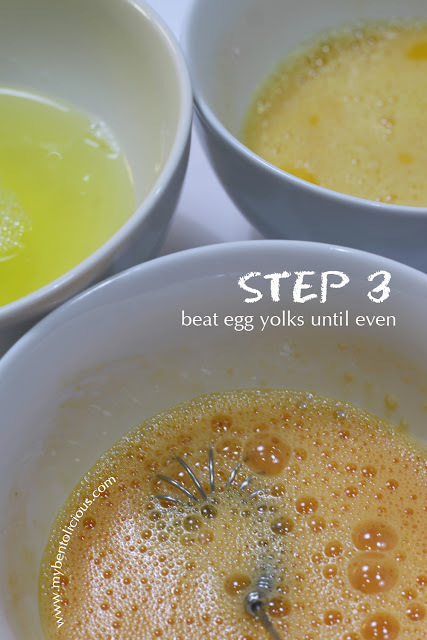 Make sure that the egg white mixture is glue well with the egg yolk mixture. As you can see on the Step 3, I've got 3 bowls which are 2 bowls for egg yolk mixture and 1 bowl of egg white mixture. And if you see the first picture on the top, the center of tamagoyaki is darker than the outside. We have 2 types of chicken egg here. One is called broiler chicken egg and the other is called organic chicken egg. 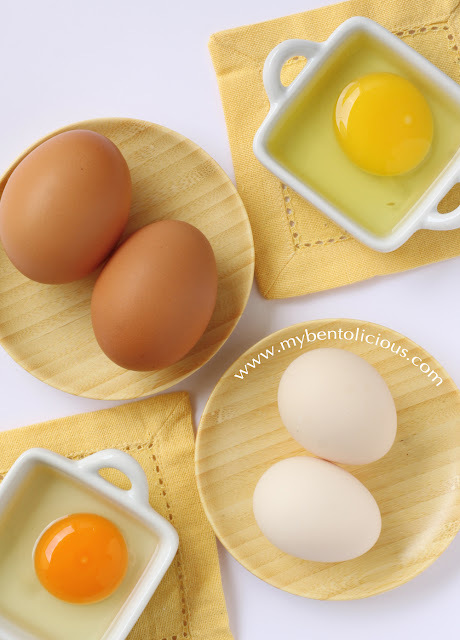 The organic chicken egg is smaller and has a white shell with a dark yellow/orange egg yolk. I love this tutorial! I always used the tutorial at lunch in a box, but you have different tips once again. I only need a better tamagoyaki pan but I will try it again soon :) Thanks!! Great step by step! I don't understand how you got the insides to look like a hard boiled egg though? Thanks Lia, what a wonderful post. 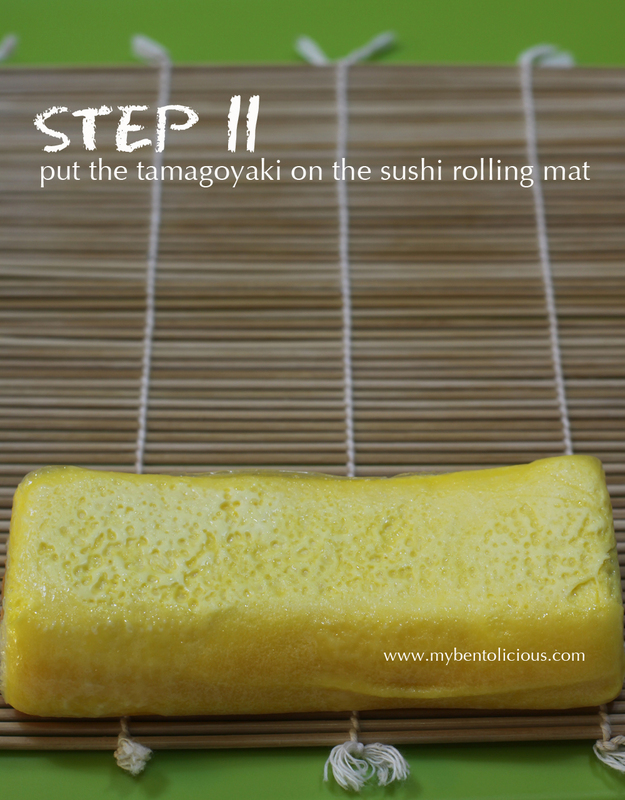 I never used a sushi rolling matt for my tamagoyaki before, and of course mine were never round like yours either. 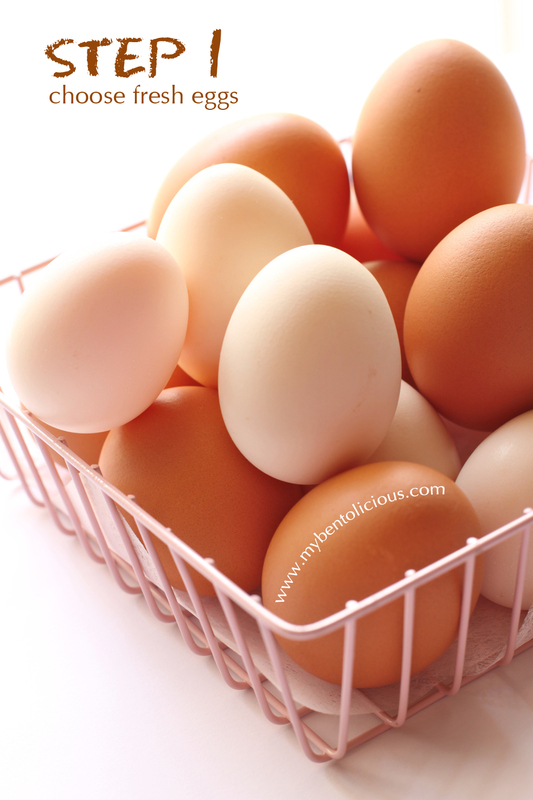 I get two days of next week I want to compare our organic eggs to regular ones! 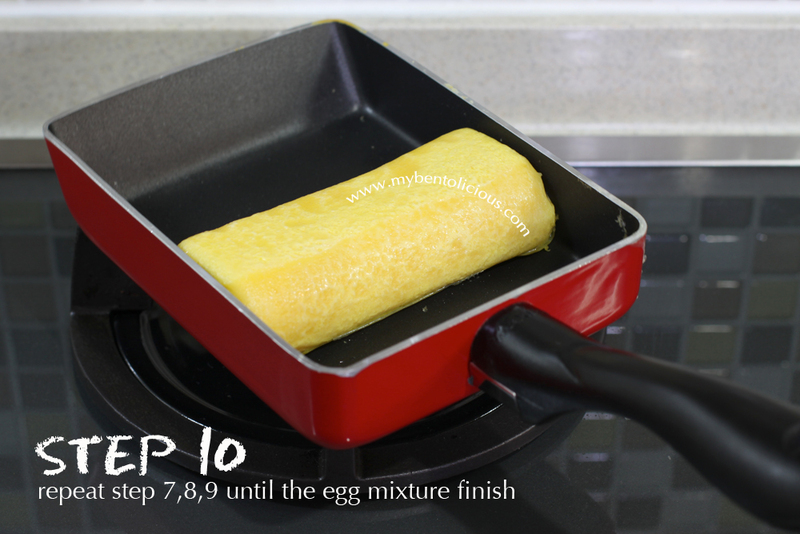 @Rio : My kids love eggs and tamagoyaki is their favorite. Please try it and you can use your own tamagoyaki recipe too :) Thanks a lot Rio! I made Tamagoyaki before for my Japanese cuisine but yours look so pretty with the two tone color :D Very pretty! Gorgeous tutorial, thank you Lia!! Fantastic! Looks yummy too, thanks for the steps. @Bentobird : Thanks a lot Jenn! @kel : Thanks a lot Kel! Have a great weekend Lia! It's cool how it really does look like a hard-boiled egg! Was it intentional. I absolutely love staring at your beautiful pictorials. You work so neatly, the way I would.... in my dreams. Hehe! I love this, cannot wait to try it. 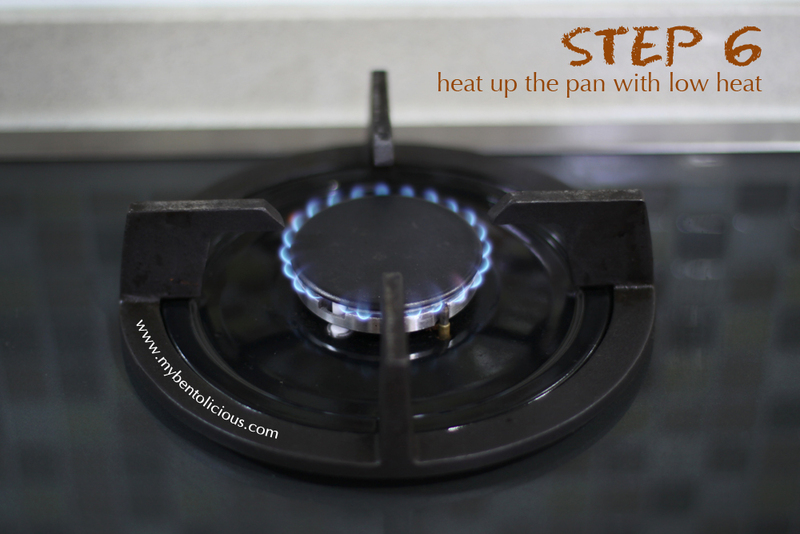 I made one on our griddle once and it came out ok, but I NEED one of those pans! Your photos are so great by the way, I just love eggs! I'm not sure if my youngest would be willing to eat this in a bento room temp. though. Thinking a dry run at home is in order! wow what a great idea! It looks so cool! 8-D Have to try! @Susan Yuen : Thanks a lot Susan! You still amaze me Lia! Your photos are exquisite and your tamagoyaki looks so clean and fresh. Thank you so much for sharing this wonderful tutorial. If I get really brave I'm going to try your technique! Just found/like your lovely blog. 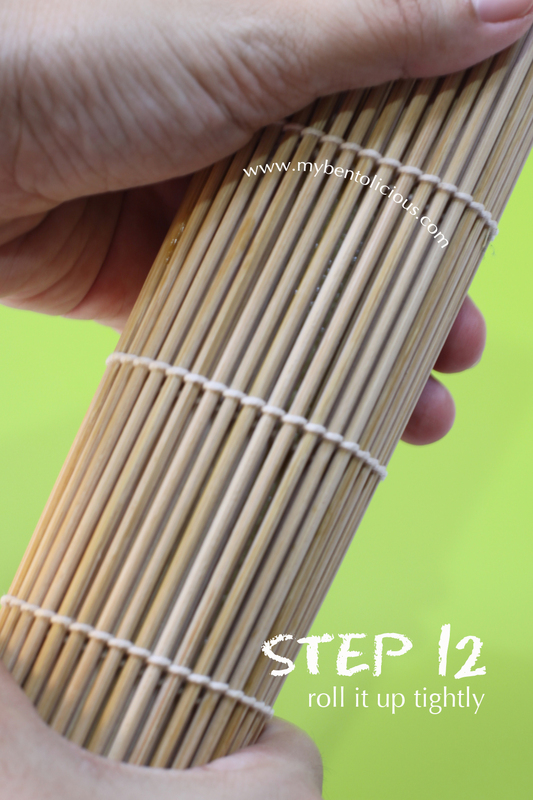 Hope more post from you on step by step make easy for us to follow. Tks for sharing & god bless always. @Token : Thanks a lot Token! Now THAT is inspirational, Lia! I must try this at once. Thank you! @Judy : Hi Judy! Thanks a lot! That is so cute! 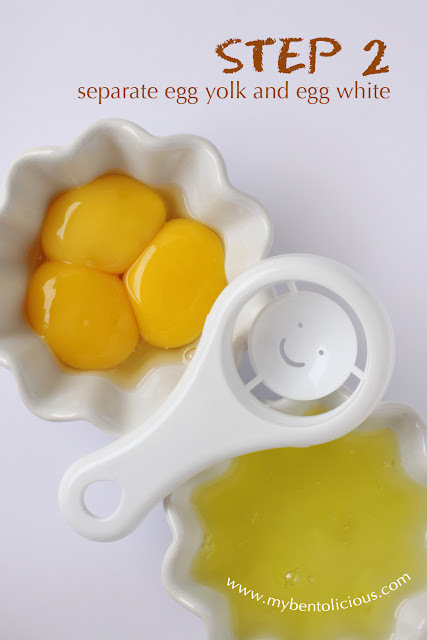 What a fun way to eat egg :D Thanks for the amazing tutorial! @Jenn : Thanks a lot Jenn! by the way love your picshoot.. I always enjoy your tutorial Lia! I'm into Japanese food nowadays so your tutorial will come in handy. 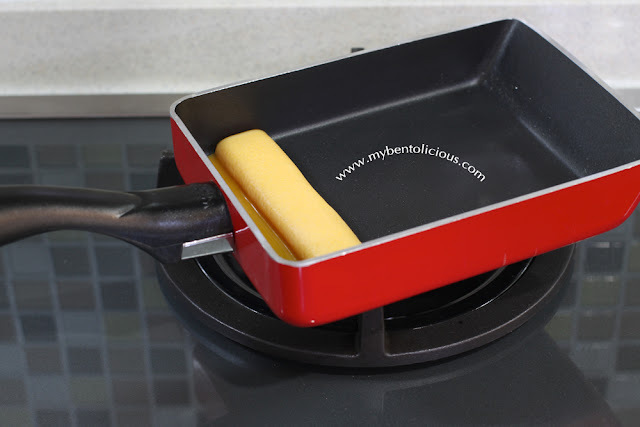 I have to get a tamagoyaki pan!! Oh my soooo Great!!! I love it! Thank you very much now I have a very easy recipe that I can try. I'm excited to have my own bento ^_^v Oh by the way, you might like to try the stainless steel bento tiffin container. It is an alternative for plastic. It's really good and I'm very amaze of it. 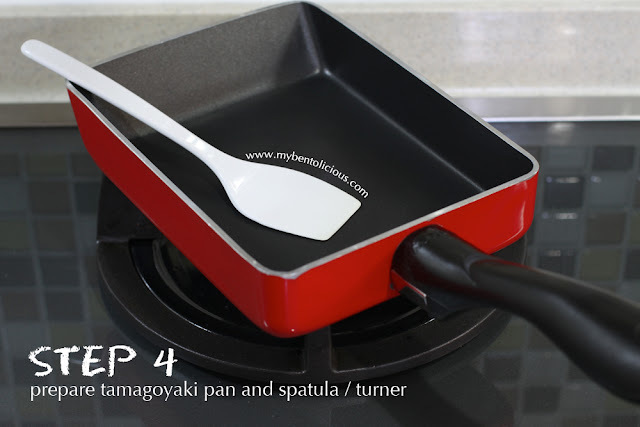 where we can buy that tamagoyaki pan in indonesia??? Ace hardware? ?